UNHCR staff verify and assist Venezuelan refugees, asylum seekers and persons of concern at the recently opened Rondon I shelter in Boa Vista, Roraima, in northern Brazil. “UNHCR welcomes last night’s decision of the Court to overturn a decision by a Federal Judge in Roraima border state, to suspend admission of Venezuelans to the country and close the border,” said the agency’s spokesperson William Spindler. In Geneva, Mr. Spindler added that hundreds of Venezuelans cross into Brazil’s northern Roraima state near the small border city of Pacaraima every day, in search of safety. The route was blocked temporarily on Monday, when the frontier was closed in line with the initial decision by a federal judge in Roraima. Hours later it was overturned by Brazil’s higher federal court. More than 200 Venezuelans were unable to finalize their immigration registration during the brief closure on Monday, but they were not deported or pushed back over the border, according to the UN agency. Today, Brazil is home to more than 32,700 Venezuelan asylum seekers; another 25,000 are legally permitted to stay in the country, as they have work or residency permits, or similar. “The total number of Venezuelan asylum seekers this year — this is asylum claims everywhere — is 117,000 … and this figure surpasses the total number of claims made last year,” Spindler told journalists in Geneva. The development comes amid reports of widespread food and medicine shortages, skyrocketing inflation, political unrest and violence in Venezuela. Venezuelans wait outside the Federal Police office in the Brazilian border city of Pacaraima. In August 2018, Brazilian Federal courts temporarily halted, then resumed, admission of Venezuelans seeking asylum or special permits to stay in the country. Just last month, the UN human rights office (OHCHR) published a report highlighting the Venezuelan Government’s continuing failure to hold perpetrators of “serious human rights violations” accountable, including “killings, the use of excessive force against demonstrators, arbitrary detentions, ill-treatment and torture”. Noting “tensions” at the frontier between Roraima residents and the newcomers, the UNHCR spokesperson said that the agency would continue to support efforts to meet the needs of those arriving in Brazil. Until now, the authorities have traditionally welcomed anyone in need of protection and provided them access to basic rights and services, Spindler said, adding that movement between borders in Latin America is often very fluid. To date, UNHCR has helped more than 800 Venezuelans relocate to other areas in Brazil in order to alleviate the strain on the state, which has seen the greatest influx of people seeking shelter. The UN agency says that most of those abandoning Venezuela for Brazil — and neighbouring Colombia — need urgent assistance with documentation, shelter, food and health care, which it seeks to provide by working with the authorities and partner organizations. 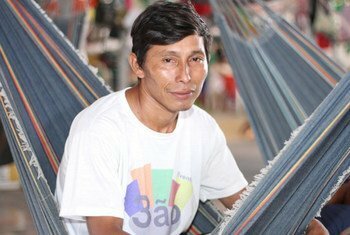 Warao community leader Eligio Tejerina, 33, sits in a hammock at Pintolandia Shelter in Boa Vista, northern Brazil, to which he and his family fled to escape conflict and instability in their native Venezuela, May 2018. Among those helped by UNHCR are a growing number of indigenous people left vulnerable by food shortages. They include the family of 33-year-old Warao community leader, Eligio Tejerina, whose youngest child died after falling sick with pneumonia. “Since they were out of medicine, she could not receive proper treatment,” the 33-year-old Warao community leader said. His surviving five children were already weakened and distressed by hunger. No longer able to find food in the local market, their only option was to leave, Tejerina explained.